Fresh off an ARCA Racing Series championship in 2018, Sheldon Creed graduates full time to the NASCAR Gander Outdoors Truck Series, where he’ll run for Sunoco Rookie of the Year honors driving the No. 2 Chevrolet Silverado for GMS Racing. Creed first started racing when he was three, riding BMX bikes and winning a state championship two years later. The next year, he started racing motocross, winning two Barona MX Park championships in 2005. Afterwards, he was invited to KTM’s Jr Supercross Challenge, finishing second. At the age of eight, Creed began competing in Quarter Midget racing, eventually moving to Championship Off-Road Racing’s Trophy Karts. Creed won a championship in each year of Trophy Kart competition, and also won the 2012 Superlite championship. In 2013 he burst into the national limelight driving in the Speed Energy Stadium Super Trucks and Lucas Oil Off Road Racing Series. He took home the Speed Energy Stadium Truck Series championship in 2015 while also winning gold medal in the Stadium Super Trucks division at the X-Games in Austin, Texas. He went back to back with Stadium Super Truck Series championships in 2016 and, at age 18, became the youngest driver to compete in the Dakar Rally. He made his NGOTS debut that summer at Eldora Speedway. In 2017, Creed competed in several motorsports disciplines, including running the Baja 1000, Trans-Am races, 11 starts in the ARCA Racing Series, six combined K&N Pro Series starts and made his NASCAR Xfinity Series debut at Road America. In addition to Creed’s ARCA title in 2018, he also scored his first career K&N Pro Series West victory at the Las Vegas Motor Speedway Dirt Track. 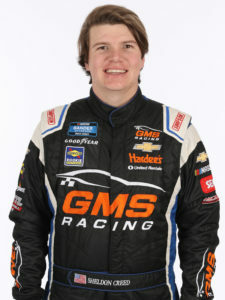 In the fall of 2018, he was announced to drive several races for GMS Racing in NGOTS competition and was announced the full-time driver of the No. 2 machine in November 2018.